When buying a cowhide rug, the first thing that you should know is how to care for it. Even if authentic cowhide rugs are durable, there are still some things to do in order to ensure that you would maintain its beauty. One problem that owners of genuine cowhides are encountering is – curling. Some customers on our site ask how they can ensure that the item won’t curl and our answer is usually, we really cannot guarantee that it won’t curl but there are things you can do to prevent it from happening. Curling happens not because the rug is poor quality, it is just due to the fact that the leather fibers on the edge are thinner than the ones in the center. Another factor is environmental. There’s one way to prevent curling from happening – DO NOT PUT YOUR RUGS UNDER DIRECT SUNLIGHT. Intense heat will cause curling for some reasons, so just don’t do it. And if it’s already curly, just fold the curly portion on the opposite side and spray a bit of water and massage it slowly. This should be done a few minutes and it should work. If not, then a ‘healthy’ trim can also be done on that area. 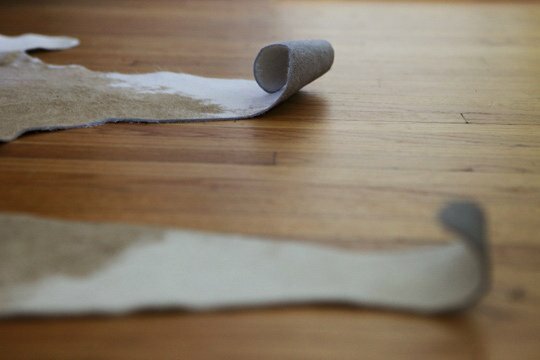 Curling naturally happens to genuine cowhides, you just have to know how to avoid it or fix it when it does. This entry was posted on October 8, 2013 by ecowhides and tagged authentic cowhide rug, authentic cowhides, cowhide rugs, cowhides, curling, curling cowhide rugs, curling cowhides, genuine cowhide rug, sheepskin rug, what to do with curling cowhide rug.